Go North East scooped three accolades at the prestigious UK Bus Awards, with its head of commercial and retail being awarded gold in the Leadership and Inspiration category. Hosted by BBC News presenter Jane Hill at the Troxy, in London’s East End on 21 November, Go North East beat off stiff competition from its transport peers to take home one gold in the Leadership and Inspiration and two silvers for its Putting Passengers First and Marketing Initiative of the Year entries. Stephen King joined Go North East as an apprentice aged 16 and has worked his way up the company to head of commercial and retail; a position he was appointed to in summer 2016. 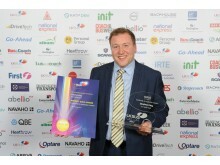 Described by the judges as passionate, committed and a good ambassador for the bus industry, Stephen was also recognised for successful branding, innovation and sponsorship, and the judges were impressed with how he has made Go North East part of the region's business community, bringing benefits to the company. One of the Chartered Institute of Marketing’s (CIM) ‘North East 50 Marketing Greats’, Stephen is responsible for overseeing the firm’s commercial strategy and function and in 2016 he spearheaded Go North East’s hugely successful ‘£1 flat fare for 18s and under’ ticketing change. 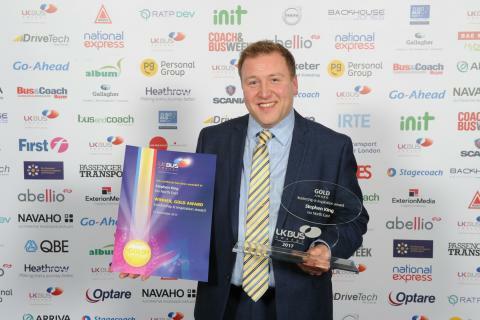 Kevin Carr, managing director at Go North East commented: “The annual UK Bus Awards are an important date in all bus operators’ calendar, so I am extremely proud that we walked away with three award wins. Including Go North East's three accolades, parent company the Go-Ahead Group enjoyed 12 successes at the UK Bus Awards, collecting six golds, three silvers and three bronze awards.